Cytokinesis in eukaryotic cells is often accompanied by actomyosin cortical flow. Over 30 years ago, Borisy and White proposed that cortical flow converging upon the cell equator compresses the actomyosin network to mechanically align actin filaments. However, actin filaments also align via search-and-capture, and to what extent compression by flow or active alignment drive furrow formation remains unclear. 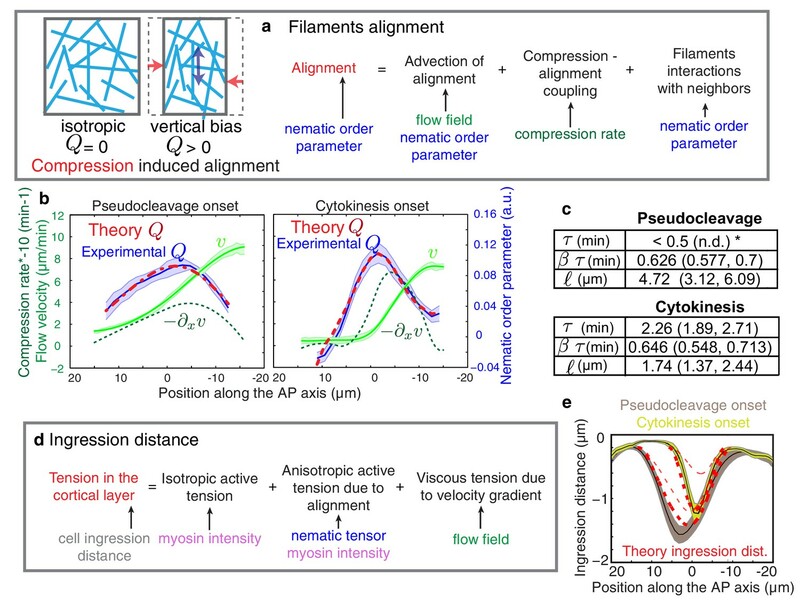 Here, we quantify the dynamical organization of actin filaments at the onset of ring assembly in the C. elegans zygote, and provide a framework for determining emergent actomyosin material parameters by the use of active nematic gel theory. We characterize flow-alignment coupling, and verify at a quantitative level that compression by flow drives ring formation. Finally, we find that active alignment enhances but is not required for ring formation. Our work characterizes the physical mechanisms of actomyosin ring formation and highlights the role of flow as a central organizer of actomyosin network architecture. Just under the surface of every animal cell, a thin and dynamic network of filaments called the cell cortex acts as a scaffold and determines the cell’s shape. When the cell divides, this material re-organizes to make a ring of filaments – known as the cytokinetic ring – across the middle of the cell. This ring then constricts to split the cell into two separate daughter cells. The filaments are guided to form the ring by specific proteins around the middle of the cell. A process called cortical flow – the mechanical compression of filaments towards the middle – also influences the shape of the ring. However, it is not clear to what degree cortical flow actually helps the ring to form. A tiny worm called Caenorhabditis elegans is often used to study how animal cells divide and grow. When the C. elegans embryo is made of just a single cell, two rings of filaments form consecutively as this cell prepares to divide. Reymann et al. used microscopy to investigate how filaments are arranged in C. elegans embryos as the rings assemble. The experiments showed that filaments are arranged into rings in locations where the filaments are being mechanically compressed by cortical flow. The first ring forms and partially constricts, and then relaxes once the cell is polarized; that is, once the cell has developed two distinct ends. A second ring then forms during cytokinesis and constricts to divide the cell into two. To understand the physical changes occurring, Reymann et al. compared the experimental data with a mathematical model of the cortical network. This model assumed that the cortical network acts as a thin film in which the orientation of the filaments is coupled to the flow of the fluid. Reymann et al. used this model to demonstrate that the observed arrangements of the filaments in both rings can be explained by cortical flow. Together, the findings of Reymann et al. highlight the central role that cortical flow plays in organizing rings of filaments in C. elegans. Future studies will explore whether cortical flow is linked to other mechanisms that affect the formation of the cytokinetic ring. Cytokinesis begins in late anaphase, triggered by regulatory pathways with feedback from the mitotic spindle that ensure appropriate positioning of the molecular machinery (reviewed in Fededa and Gerlich, 2012; Green et al., 2012). As a consequence, the small regulatory GTPase RhoA (Piekny et al., 2005; Tse et al., 2012) and the molecular motor myosin (Shelton et al., 1999; Werner and Glotzer, 2008) are enriched in an equatorial band (Piekny et al., 2005; Werner and Glotzer, 2008). Myosin can directly organize the actin network (Miller et al., 2012; Soares e Silva et al., 2011; Vavylonis et al., 2008), and if myosin-based active alignment (e.g. via search-and-capture [Vavylonis et al., 2008]) or flow-based compression as proposed by White and Borisy (White and Borisy, 1983; Rappaport, 1996) drive furrow formation and cytokinesis in eukaryotes remains unclear (Green et al., 2012; Bray and White, 1988; Levayer and Lecuit, 2012; Mendes Pinto et al., 2013; Cao and Wang, 1990; Murthy and Wadsworth, 2005; Zhou and Wang, 2008). We set out to address this question in the one cell embryo of the nematode C. elegans which forms two constricting ingressions, first a pseudocleavage furrow during polarity establishment, and then a cytokinetic furrow during cytokinesis (Figure 1—figure supplement 1a, Video 1) (Munro and Bowerman, 2009; Rose et al., 1995). Notably, the pseudocleavage furrow is linked to cortical flow (Mayer et al., 2010; Munro et al., 2004) and lacks regulatory control from the mitotic spindle (Werner and Glotzer, 2008). We first characterized the actomyosin cortical network during pseudocleavage and cytokinesis. For this, we generated a Lifeact::mKate2 fluorescent line of C. elegans by coupling the Lifeact peptide to the far-red fluorophore mKate2 that was codon optimized for C. elegans (Redemann et al., 2011) (see Materials and methods and Video 2). This allows us to quantify cortical actin filament orientation in space and time, as well as cortical flow velocity fields by Particle Image Velocimetry (PIV, Figures 1 and 2, Figure 2—figure supplement 1) (Mayer et al., 2010). We find that actin filaments change from a randomly oriented and isotropic gel before cortical flows initiate, into a more circumferentially aligned organization at the future site of furrow ingression during both pseudocleavage and cytokinesis (Figure 1b, Figure 1—figure supplement 1 and Videos 1 and 3). We studied how pseudocleavage and cytokinesis differ in the spatial distribution of molecular regulation and contractility within the equatorial region (Figure 1). Non-muscle myosin II (NMY-2) is the essential molecular motor that drives both cortical flow and cytokinesis (Shelton et al., 1999; Guo and Kemphues, 1996), whereas the small GTPase RhoA (Piekny et al., 2005; Tse et al., 2012), when active, is responsible for its local activation. At the onset of cytokinesis, active RhoA and NMY-2 locally increase at the position of the contractile ring, while for pseudocleavage we observed no such increase (Figure 1). Instead, the equatorial region in pseudocleavage corresponds to a transition zone with a gradual decrease of RhoA and myosin between the anterior region of high and the posterior region of low contractility (Figure 1) (Mayer et al., 2010). The actin nucleator formin CYK-1 is downstream of RhoA (Piekny et al., 2005) and follows a similar pattern of localization, and actin bundling via anillin (Piekny and Glotzer, 2008) or plastin also does not appear to be increased in the equatorial region during pseudocleavage (Figure 2—figure supplement 5e–f). To conclude, the pseudocleavage furrow ingresses with a circumferential alignment of filaments in the gel, but without a local zone of RhoA activation and the corresponding local increase in myosin and formin density. 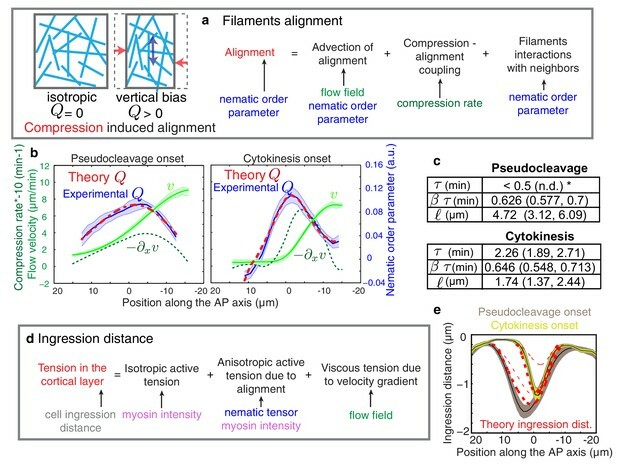 Since search-and-capture like mechanisms require a localized band of myosin and actin nucleators at the equator to drive myosin-based active alignment (Vavylonis et al., 2008), this suggests that actin filaments in pseudocleavage align via flow-based compression and not via active alignment. Actomyosin gel dynamics in the C. elegans zygote. Cortical and medial planes of an embryo expressing both Lifeact::mKate2 and endogenous NMY-2::GFP. Left panel, medial plane Lifeact:mKate2, center, cortical NMY-2::GFP, right panel, cortical Lifeact:mKate2 (min:s). 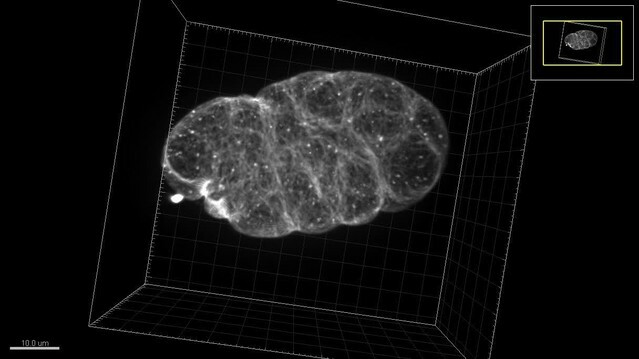 Three-dimensional reconstruction of an early one-cell embryo of C. elegans expressing Lifeact::mKate2. The back of the embryo is dimmer due to imaging. Flow and ingression during pseudocleavage and cytokinesis. Cortical flows compress the gel to generate alignment. (a) Filament orientation is quantified by a nematic order parameter; flow fields are obtained from Particle Image Velocimetry (PIV) analysis. (b) Gel flow, compression rate, filament orientation and cell ingression fields. Top row, schematic representations. Middle row, kymographs of the time evolution of the profiles along the AP axis of flow velocity, compression rate, nematic order parameter and outer ingression distance for pseudocleavage (N = 10). Bottom row, cytokinesis (N = 12). Orange dashed lines indicate the times where all four fields are stationary. Flow, compression and nematic order were determined from bottom-section and ingression from mid-section views of Lifeact::mKate2 labelled embryos (see Materials and methods and Appendix). (c) Spatial correlation between compression, alignment and ingression (see Materials and methods). Peak value positions (estimated by a Gaussian fitting of the 1D correlation curve) are indicated. See Figure 2—figure supplement 2 for spatiotemporal correlation functions. (d) Table of the temporal delays obtained from the correlation peak value positions using the mean values of the velocity in the 10 μm central region (mean values for pseudocleavage: v = 6.16 ±1.23 μm/min; for cytokinesis: v = 4.01±1.92 μm/min; mean ± SD). Cortical dynamics at flow initiation. Left panel, cortical NMY-2::GFP, center cortical Lifeact:mKate2 and a zoom is shown in the right panel (min:s). We next sought to test if flow-based compression drives actin filament alignment. To this end, we developed tools for the spatiotemporal quantification of compression by flow, of filament orientation, and of cortex ingression distance within the gel both at the onset of pseudocleavage and cytokinesis (see Appendix as well as Figure 2a and Figure 2—figure supplement 1). We find that the flow compression rate along the antero-posterior direction (AP axis or x axis), given by the spatial gradient of the velocity field −∂xv (Figure 2b), increases with time during the very early stages of pseudocleavage. The compression rate peaks in the central region of the embryo, with a maximum of ~0.4 min−1. Notably, this peak is stable for several minutes until pseudocleavage flows cease entirely (Figure 2b). For cytokinesis, we find that the early flow also proceeds in a unidirectional manner from the posterior toward the anterior (Figure 2b). Similar to pseudocleavage, the compression rate increases with time over the very early stages of cytokinesis, with the compression profile peaking at the center of the embryo with a maximum rate of ~0.7 min−1 (Figure 2b). We characterized the average actin filaments orientation by a nematic order tensor Q (Figure 2—figure supplement 1a). This analysis relies on the fact that the intensity of the Fourier transformed image encodes geometric characteristics such as its main orientation pattern (see Appendix). We find that vertical (orthogonal to the direction of flow) alignment appears coincidental in space and time with the local increase of the compression rate (Figure 2b, compare column 2 and 3). Notably, changing the direction of flow also changes the direction of alignment: off-site sperm entry leads to flows along the short axis of the egg (Goldstein et al., 1993) and actin filaments still align in the direction determined by compression (Figure 1—figure supplement 1d, Video 4 and Appendix). Finally, the ingressing furrow forms in the region where filaments are aligned (Figure 2b, column 4). Our quantifications reveal remarkable similarities between the compression rate fields, the pattern of alignment, and the ingression distance between pseudocleavage and cytokinesis (Figure 2b), suggesting common mechanisms. To conclude, actin filament alignment arises at locations of significant compression by flow. Cortical dynamics of an embryo in which flow was initiated at the side (bottom) and far from the posterior pole of the embryo. Actin filament alignment follows flow and compression, thus transitions from a horizontal to a vertical direction (min:s). If flow-based compression aligns actin filaments for forming an ingression, we would expect compression to precede or to be concomitant with alignment and ingression. The 1D crosscorrelations between compression, filament alignment and ingression distance, calculated for the time that flows are essentially stationary (Figure 2b and Figure 2—figure supplement 1), show that for pseudocleavage both compression rate and alignment peak at about the same location, while the ingression field peaks ~ 3 µm further to the anterior (Figure 2c and Figure 2—figure supplement 2 for the spatiotemporal crosscorrelations). The situation is similar at cytokinesis, except that the compression field peaks furthest to the posterior. We next translated the characteristic distances between peaks in stationary flow to temporal delays between events (see Materials and methods for further explanation). We find that for pseudocleavage, filament alignment is essentially concomitant with compression, while for cytokinesis compression precedes alignment by 0.40 ± 0.16 min (Figure 2d). Furthermore, ingression arises approximately 0.5 min after compression for pseudocleavage and 0.9 min after compression for cytokinesis. To conclude, filament alignment appears to rapidly follow compression while ingression arises with a delay. Theory predicts an alignment peak. (a) Schematic representation of flow-based alignment. For full theory refer to Appendix. (b) Average AP profiles of gel flow (light green, smoothened), compression rates (dark green) and nematic order parameter (blue) at the time of stationary flow (Figure 2C) during pseudocleavage (left, N = 16) and cytokinesis onset (right, N = 32). Error bars represent the standard error of the mean. Dashed red line indicates the respective best-fit theory predictions for the nematic order parameter (blue). (c) Table of the material parameters. See also Figure 3—figure supplement 1 and Table 1, Table 2. (d) Illustration of the cortical tension related to the ingression distance. (e) Outer ingression profiles at the onset of pseudocleavage (brown) and cytokinesis (yellow). The theoretical profiles (thick dashed red lines: active tension depends on alignment and can be anisotropic; thin dashed lines: active tension is isotropic) are determined by simultaneous fitting of both the pseudocleavage and cytokinesis datasets with a single fit parameter (see Appendix) using the myosin density, flow velocity and nematic order parameter fields. We next determined the theoretical alignment field from the experimental flow field v and compression field ∂xv. We used nonlinear least-square fitting to evaluate parameter values for which the theoretical alignment profile best matched the experimental one. There are five unknowns (three parameters that characterize emergent material properties, τ, ℓ, and β τ, as well as two boundary values of nematic order) but three spatial fields, hence the fitting procedure is significantly constrained and the best fit parameters are uniquely defined in most cases (see Appendix and Figure 3—figure supplement 1). For cytokinesis the calculated alignment profile (dashed red lines in Figure 3b) best matches the experimentally measured one for β τ =0.64 (0.548, 0.713) min (unless otherwise noted we indicate the median value together with the standard 68% confidence interval of the distribution of the bootstrap data, see Appendix), τ = 2.3 (1.89, 2.71) min and ℓ = 1.7 (1.37, 2.44) μm (Table 1 and Table 2). For pseudocleavage, β τ was similar (0.6 (0.577, 0.7) min), τ was determined to be smaller than 0.5 min, and ℓ = 4.7 (3.12, 6.09) μm larger (Table 1 and Table 2). We note that in both cases, we obtain good agreement between the theoretical and experimental alignment field, allowing us to conclude that compressive gel flow can account for alignment. Further, we observe a small τ for pseudocleavage and a larger τ for cytokinesis, which is consistent with the observation that alignment appears concomitant with compression in pseudocleavage but arises with a short delay during cytokinesis (Figure 2d). 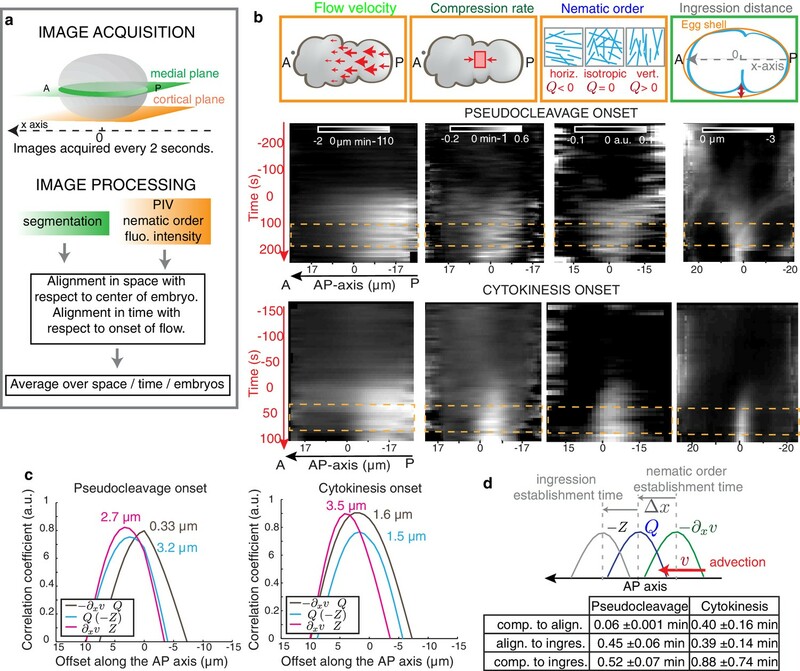 We speculate that the changes in physical parameters of the actomyosin cortical layer between pseudocleavage and cytokinesis (higher τ and smaller ℓ) reflect the fact that the cell forms a strong and more pronounced ring of aligned filaments during cytokinesis. To conclude, our results are consistent with a scenario in which actin filament alignment arises in a disordered network through compression by flow (White and Borisy, 1983; Salbreux et al., 2009; Turlier et al., 2014). Best fit gel material parameters, bootstrapping. The median values together with the standard 68% confidence bounds of the distribution of the bootstrap data are given. ‡denotes values that could be determined but that were not well constrained. Best fit gel material parameters, no bootstrapping. The mean values together with its 95% confidence bounds are given. where the right-most term describes active alignment by myosin molecular motors, with λ an alignment parameter dependent on the local myosin concentration. In our modified fitting procedure, we now evaluate the respective contributions of myosin-based active and flow-based passive alignment to the stationary Q profile, under the assumption that λ is proportional to local myosin concentration. We find that considering active alignment does not increase the overall agreement between calculated and measured alignment profiles for both pseudocleavage and cytokinesis (Figure 3—figure supplement 2). Notably, the contribution of active alignment to pseudocleavage is insignificant, while active alignment contributes to enhancing compression-induced alignment during cytokinesis (Figure 3—figure supplement 2b; see Appendix), albeit to a small degree. We conclude that compression by flow and not myosin-based active alignment is the driving force of ring formation in both pseudocleavage and cytokinesis. A key prediction from our model is that reducing flow speeds and compression rates should give rise to less filament alignment and a possible inhibition of pseudocleavage furrow formation. To test this prediction, we performed weak-perturbation RNAi experiments (Naganathan et al., 2014) of the regulatory myosin light chain of non-muscle myosin (mlc-4(RNAi) (Craig et al., 1983) to mildly reduce actomyosin flow speeds without significant changes in overall actomyosin organization (Figure 4—figure supplement 1). Short feeding times (5–7 hr) lead to a small reduction in gel flow and compression rates (Figure 4a), but actin filaments still aligned in the central region and the pseudocleavage furrow still formed and ingressed. Consistent with our hypothesis, longer feeding times (7–9 hr) lead to a complete abolishment of cortical flow and a loss of both actin alignment and pseudocleavage furrow (Figure 4b). Actomyosin foci are not required for compression-based alignment since anillin- depleted embryos (ani-1(RNAi), 24 hr) still show significant alignment under compression in the absence of these dense foci (Figure 4c) (Maddox et al., 2005; Piekny and Maddox, 2010; Tse et al., 2011). Reduced flow speeds and compression rates can also account for the absence of alignment and pseudocleavage in nop-1(RNAi) embryos, in which RhoA-dependent processes are affected and pseudocleavage formation abrogated (Figure 4d, Figure 4—figure supplement 1 and 2) (Tse et al., 2012; Rose et al., 1995; Zhang and Glotzer, 2015). Overall, these experiments lead us to conclude that reducing gel flow and compression rates affects alignment in a manner that is consistent with Equation 2. Finally, a complete loss of flow and compression abolishes pseudocleavage entirely (Figure 4b;d and Figure 4—figure supplement 1). Taken together, our results suggest that the pseudocleavage furrow arises as a by-product of compressive flows, mechanically aligning actin filaments into a ring even in the absence of localized RhoA activation. Flows and compression are required to generate alignment. (a-d) Average AP profiles of gel flow (light green, smoothened), compression rates (dark green) and nematic order parameter (blue) at the time of stationary flow during pseudocleavage onset for mlc-4 5–7 hr and 7–9 hr, nop-1 and ani-1 RNAi. Error bars represent the standard error of the mean (N = 17, 14, 10, 22 for a-d, respectively). Dashed red line indicate the respective best-fit theory predictions for the nematic order parameter (blue). For ani-1 and mlc-4 (5–7 hr), τ is small and is determined to be smaller than 0.5 min. For nop-1 and mlc-4 (7–9 hr), theory profiles were generated using the parameters obtained for the unperturbed non-RNAi pseudocleavage, since insufficient compression rates did not constrain the physical parameters. Scale bar, 10 μm. In this context we wondered if the cortex is specifically modified to favor ring formation in cytokinesis. We used our fitting procedure to determine the parameters that characterize emergent material properties of the cortex under mlc-4(RNAi). Notably, we observe that 7–9 hr of mlc-4(RNAi) leads to a reduction of the alignment relaxation time scale τ during cytokinesis. The value obtained is similar to the alignment relaxation time scale during pseudocleavage under non-RNAi conditions (Table 1 and Table 2), leading us to speculate that an increase in myosin activity via Rho signaling is responsible for the observed increase of the characteristic relaxation time τ in cytokinesis. Importantly, increasing τ allows the cell to form a pronounced ring of aligned filaments by compressive cortical flow during cytokinesis, as predicted by theory (Figure 3—figure supplement 1). Finally, we sought to find support from theory that aligned filaments in the equatorial region drive anisotropic stress generation (Mayer et al., 2010) to form an ingression (White and Borisy, 1983; Salbreux et al., 2009; Turlier et al., 2014). By use of a theory that connects anisotropic active stress generation in the active nematic gel to changes in cell shape (see Appendix and Figure 3d) we show that we cannot appropriately account for the observed ingression profiles unless we consider anisotropic active stress generation in an aligned gel (Figure 3e, Figure 3—figure supplement 3). This suggests that anisotropic active stress generation in a network of aligned actin filaments is important for forming an ingression. To conclude, we find that compression by flow drives actomyosin ring formation in both pseudocleavage and cytokinesis, as originally proposed by White and Borisy (White and Borisy, 1983) (Figure 5). For this, we provide a general framework for determining emergent material parameters of the actomyosin gel. This characterizes flow-alignment coupling and allows for capturing essential aspects of the mechanics of furrow generation. Our analysis of the pseudocleavage ingression in C. elegans demonstrates that constricting rings can form in the absence of equatorial RhoA activation. This reveals that cortical flow functions as a central organizer of network architecture, mechanically aligning filaments to form a constricting furrow in the equatorial region without a localized increase of actin nucleation (Figure 2—figure supplement 5,f) and myosin contractility (Figure 1b-d). Finally, it will be interesting to investigate if a cortex that is aligned by compressive flow favors the recruitment of specific actin binding proteins such as bundling or motor proteins (Robinson et al., 2002), comprising an interesting mechanism of positive feedback for stabilizing and enhancing the ring during cytokinesis. Our work highlights that determining emergent material properties of actomyosin is important for understanding cytokinesis, and a challenge for the future is to link emergent material properties at the larger scale with molecular mechanisms (Mendes Pinto et al., 2013; Eggert et al., 2006). Existing reagents did not allow for detailed and long-term imaging of actin filaments in embryos, which is critical for reliably quantifying their orientation. Hence, we generated a new Lifeact transgenetic line with enhanced actin filament labeling (SWG001). A codon optimized for C. elegans far-red fluorophore, mKate2 kindly shared by Henrik Bringman (Redemann et al., 2011) (26 kDa, 588/633 nm) was added to the actin probe with a linker (66 bp) and cloned into MOSCI vector containing unc119 rescue gene (Hyman Lab) under the control of the mex-5 promoter. Stable integration was obtained by bombardment of this plasmid in DP38 strain. This strain was then backcrossed with N2. In this line, we observed within the cortical plane bright actin filament labeling with a high signal-to-noise ratio and little photobleaching. Importantly, overall cortical organization and flow dynamics appeared to not be affected by this reagent, foci lifetime, spacing, cortical flow velocities were similar to previous measurement with other fluorescent lines. A dual colored transgenic line was obtained in order to image simultaneously actin and myosin dynamics by crossing Lifeact::mKate2 strain with LP133 (NMY-2::GFP obtained by CRISPR (Dickinson et al., 2013), SWG007). The RhoA biosensor used for Figure 1 was developed by the Glotzer lab (GFP::AHPH, C. elegans strain MG617, Tse et al., 2012). This sensor consists of GFP fused to the C-terminal portion of C. elegans anillin, which contain its conserved region (AH) and pleckstrin homology (PH) domain. It lacks the N-terminal myosin and actin-binding domains but retains its RhoA-binding domain. The strains expressing CYK-1:GFP (SWG004) and PLST-1:GFP (SWG005) were obtained by the insertion of a GFP tag at the endogenous locus in their C-terminal region using CRISPR according to Dickinson et al (Dickinson et al., 2013). C. elegans worms were cultured on OP50-seeeded NGM agar plates as described (Brenner, 1974). L4 mothers were maintained overnight at 20°C before dissection in M9 buffer. For imaging, one-cell embryos were mounted on 2% agar pads, thereby slightly compressed to increase the cortical surface visible in a confocal plane. Images were acquired with spinning disk confocal microscope (Zeiss C-Apochromat, 63X/1.2 NA or 100X/1.42 NA, Yokogawa CSU-X1 scan head and Hamamatsu Orca-Flash4.0 camera) every 2 s on two or three different planes (one or two at the bottom for a cortical section, and one 12 µm above for a medial section of the embryo) . For 3D acquisitions, Z-stacks were acquired every 0.2 μm. We assume the shape to be rotationally symmetrical to the longer axis, thus the outline of one medial section of the embryo reflects faithfully cell shape changes and ingression distance. RNAi experiments were performed by feeding (Timmons et al., 2001). L4 worms were grown at 20°C on feeding plate (NGM agar containing 1 mM isopropyl-β-D-thiogalactoside and 50 μg ml−1 ampicillin) for the required number of hours before imaging. Spatiotemporal correlation functions were calculated for all time points during the stationary period, in the 30 μm central region of the embryo. The plot of the spatial correlation only (1D correlation function) is shown in Figure 2c between the compression, alignment and ingression data sets. Peak value positions are obtained by a Gaussian fitting procedure and allow the calculation of positional differences between the different data sets. Because the flow field appears stationary, we expect this distance between peaks of compression, alignment and ingression to arise due to temporal delays between these events in the reference frame co-moving with the cortical flows. We thus translated the characteristic distances between stationary peaks to temporal delays using the average flow velocity in the −10 μm to 0 central region (6.16 ± 1.23 µm/min for pseudocleavage and 4.01 ± 1.92 µm/min for cytokinesis) (Figure 2d). Compression drives alignment for furrowing. Schematic illustration of flows, cytoskeletal organization and cell shape changes during pseudocleavage and at the onset of cytokinesis. Actomyosin gel dynamics in the C. elegans zygote after 24 hr nop-1(RNAi). Actomyosin gel dynamics in the C. elegans zygote after 26 hr ani-1(RNAi). Actomyosin gel dynamics in the C. elegans zygote after 14 hr mlc-4(RNAi). Image segmentation was done on the medial plane acquisition using the JFilaments plugin of ImageJ (Smith, 2010). Ingression levels along the AP axis were calculated using the position of the eggshell as a reference. The thickness of the extra-embryonic layer (Johnston and Dennis, 2012) (0.2 μm) was subtracted prior to comparison with the theoretical predictions. We considered here only the outer ingression without the membrane overlap zone (as shown in Figure 2b and Figure 3—figure supplements 3 and 4). The outer ingression level is a good indicator of cell shape changes at the onset of the formation of an ingression furrow (before deep membrane overlap region is actually extended), the period of interest for this study. Background fluorescence was subtracted for fluorescence intensity quantification, and normalized to maximum intensity for the RhoA biosensor. (A1) FT(qx,qy)=∑x,yI(x,y)e−i 2π(qx x+qy y)N.
where the negative sign is introduced to take into account the rotation in order introduced by the Fourier transform. Qxx>0 or Q<0 indicates positive alignment parallel to the x axis, while Q>0 indicates alignment parallel to the y axis. Qxy=Qyx>0 indicates alignment along the diagonal y=x, and Qxy<0 indicates alignment along the diagonal y=−x. Embryos were aligned in time (see below) and in space according to the embryo center. For averaging purposes only the embryos for which the direction of the polarizing flow corresponded to the long axis of the embryos were taken into account, and embryos that polarized from the side were discarded. For alignment with respect to time, temporal shifts were calculated by fitting an error function to the anterior-posterior velocity vx evolution in time obtained at a fixed position in the posterior region (an example is shown in Figure 2—figure supplement 1b). Flow velocities and nematic order parameters were then averaged in space and time, and over an ensemble of embryos. We identified the time period of approximate stationarity from these average graphs (see also Figure 2b and Figure 2—figure supplement 1). As a control, choosing a period of a minute just prior to onset of furrow ingression for each embryo individually, and then determining the ensemble average of these graphs gave very similar results (data not shown). To check that our quantification method of the nematic order parameter is meaningful and reliable, we performed tests with synthetic images of filamentous networks generated with Matlab. These artificial images allowed us to modulate several parameters: the filament density, their intensity as well as the signal to noise ratio. We proceed as follows for the generation of these images: each filament has a random length taken from a normal distribution with mean and standard deviation 50±20 μm, a random starting point is selected in the image, from which the filament elongates. During elongation, a random small variation in the direction of growth is introduced, as well as in the local filament brightness. Variations in order are introduced by selecting the initial direction of growth of each filament α. The angle α takes values between 0 and π and is selected from a probability P(α) which can either be uniform (Punif(α)=1/π) or built such as to favor the vertical direction of initial growth around the orientation α=0. The anisotropy in the angle distribution is modulated by a parameter B: for B=0 the network is isotropic, and becomes more anisotropic for increasing value of B. The final synthetic images of the actin network are then blurred by a Gaussian filtering before some background noise is added to reflect the impact of the point-spread function of the microscope (Figure 2—figure supplement 4a). Figure 2—figure supplements 3 and 4 shows the result of quantification of the nematic order parameter using such synthetic images. Our measured nematic order parameter reflects the anisotropy in the artificial networks (Figure 2—figure supplement 3d), demonstrates that increasing filaments density does not significantly impact the quantification, and reveals that a good signal to noise ratio is required. Note however that our measured order parameter can only be viewed as an approximation of the actual nematic order parameter of the network, but does capture general features of the state of alignment. To rule out the possibility that the ovoid zygote shape or an unknown pre-established positional cue determines the location and the direction of filament alignment, we analyzed embryos in which flow was initiated at the side and far from the posterior pole of the embryo. Such a situation arises in rare cases due to off-site sperm entry (Goldstein et al., 1993). Here, cortical flow is initially not aligned with the long axis of the egg (Hird and White, 1993; Rappleye et al., 2002). If filament alignment indeed arises through compression by flow, we would expect filaments to still align in a direction that is perpendicular to the axis of compression and the direction of flow even when flows are not aligned with the AP axis. Indeed, we observed initial actin filaments alignment along the long axis of the egg and thus in a direction determined by compression in cases where flow was initiated at the side of the embryo (Figure 1—figure supplement 1d and Video 4). 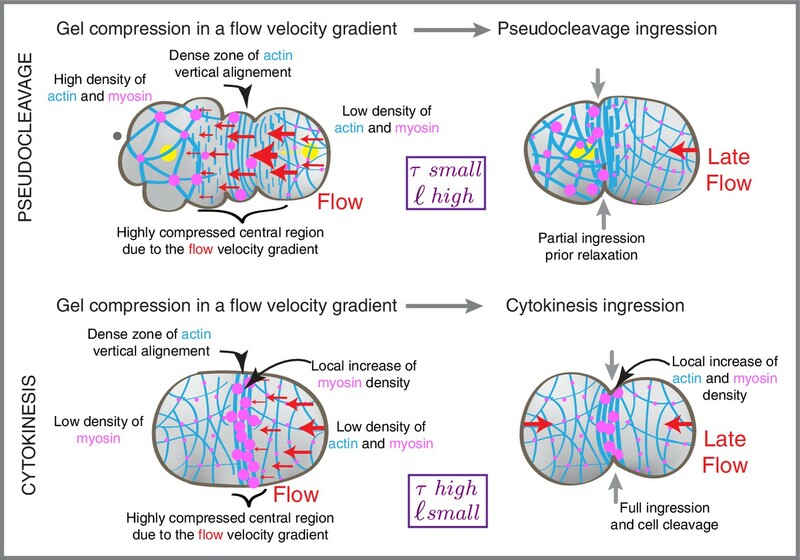 We conclude that actin filament alignment follows cortical flow and compression and is independent of the elongated shape of the embryo. The nematic order parameter for a two-dimensional liquid crystal is defined in a Cartesian frame as (De Gennes and Prost, 1993) Qij=<ninj−12δij> and can be used to describe actin filament alignment. The brackets indicate the local averages over all filament bundles at a given position, and ni, nj are the components of the unit vectors along which each individual filament bundle is aligned. Note that we do not quantify unique filament orientation but an average orientation at the micrometer scale due to high density of filaments and the presence of bundles. The nematic tensor is traceless, such that Qyy=−Qxx=Q. with τ=γ/K the characteristic time of the dynamics of the nematic order parameter's relaxation. At steady state, Equation (A14) reduces to Equation (2) in the main text for the case that λ0=0, and Equation (3) for λ0≠0, with Q=Qyy=−Qxx and λ=τλ0(c)Δμ. For λ>1, the isotropic state becomes unstable and filaments spontaneously align; we assume in the following λ<1. Note that Equation (A15) yields Qxy=0. The first term on the right hand side of Equations (2) and (3) describes advection of alignment by flow, the second term accounts for the coupling between compression and alignment, the third term captures that actin filaments tend to be aligned with their neighbors (as represented in Figure 3a). The fourth term on the right hand side of Equation (3) captures active alignment driven by myosin activity. Note that considering active alignment by myosin motor proteins results in the addition of an extra term where nematic order is proportional to myosin. This implies that active alignment only enhances or decreases the degree of ordering, but on its own cannot set the main orientation of filaments. Hence the orientation of alignment is still dictated by compressive flows. Using this additional term for an active nematic fluid allows us to estimate the contribution of active alignment by myosin to the experimental nematic order parameter profile, which is insignificant for pseudocleavage and is low for cytokinesis (Figure 3—figure supplement 2). Note also that the product βτ determines the coupling between compression and alignment in stationary flow, and controls the height of the nematic order parameter peak (Figure 3—figure supplement 1). The length scale ℓ influences the width of the alignment peak, while the time scale of relaxation τ controls the distance between the compression peak and the alignment peak (Figure 3—figure supplement 1). For the fits shown in Figures 3b, 4 and Figure 3—figure supplements 1 and 2, we use experimental data for Qyy(x) and vx(x) measured along the AP x-axis and averaged as described previously during the stationary flow period and over several embryos. In order to verify whether Equations (2) and (3) in the main text can account for experimentally measured profiles of the nematic order parameter, we proceeded as follows. Continuous velocity profiles along the AP axis vx(x) are obtained by fitting spline functions to measurements of cortical velocity. The spline functions are chosen to be piecewise third order polynomial functions, with imposed continuity of the function and its first derivative. The continuous velocity profiles are used to obtain the corresponding velocity gradient ∂xvx(x) (Figure 3b). Equations (2) and (3) can then be numerically integrated using this velocity gradient. To integrate them, we left the values of Qyy(x) and ∂xQyy(x) at the left boundary as free fitting parameters C1 and C2. In addition, we specified the parameters βτ, τ and 1/ℓ2, as well as λ′τ (λ=λ′τ c(x)/c0, with c the myosin concentration and c0 a reference concentration taken to be the maximum measured concentration) when myosin-based active alignment is taken into account. For each theoretical curve reported in the paper, the parameters βτ, τ, 1/ℓ2 and λ'τ as well as the boundary values of Qyy and ∂xQyy are adjusted with a least squares fitting procedure to match the theoretical profile of Qyy(x) to the experimental profile. Uncertainties for the fitting parameters are obtained as the square root of the diagonal terms of the covariance matrix for the parameter estimates. Negative values for τ or ℓ2 are not allowed in our description as we assume that the cortex is in the isotropic phase. We impose positivity of these parameters by introducing renormalized parameters τ=ea and ℓ2=eb, fitting the new parameters a and b and transforming them back to obtain the physical parameters. To check for consistency of fitting results and to provide an alternative means of estimating confidence intervals, we implemented a bootstrap method. Once the fitting procedure is performed, we generate 100 new sets of data points by reshuffling randomly the residuals of the fit and adding them to the profile of nematic order Qyy(x) obtained from the original fit, evaluated at the positions of the data points. The new data sets generated by this method are used to perform new fits and obtain a distribution of fitting parameters. Importantly, we found the original fitting parameters to be placed within the 68% confidence interval of the distribution of the new data set (compare Table 1 and Table 2). For pseudocleavage, τ was found to be small and the data did not allow for its precise quantification, but fixing its value to times below 0.5 min allows for essentially equally good matches between theory and experiment without significant changes to the other parameters (Figure 3—figure supplement 1). In addition, note that increasing the time τ tends to increase the degree of alignment for a given flow and compression profile (Figure 3—figure supplement 1). Furthermore, decreasing the characteristic length ℓ gives rise to a ‘sharper’ and more confined alignment peak (Figure 3—figure supplement 1). where vij is the symmetric velocity gradient tensor on the surface (Equation A26). Here, ζ represents the isotropic part of the active tension generated by myosin molecules, and tij,nematic is the part of the active tension which depends on the nematic order parameter Qij. (A21) eϕ= ∂ϕX= (0rcos ϕ−r sin⁡ ϕ). (A22) n= es × eϕ(|es × eϕ|)=(−∂sr−sin⁡ ϕ ∂sx− cos⁡ ϕ ∂sx). (A24) Cij= −n⋅∂iej=(∂sψ00r sin⁡ ψ). with f1 and f2 two functions of Q2= QijQij, and f1(0)=0, as an isotropic stress component independent of Q has already been included in (Equation A16). one recovers Equation (A28S27) and (A29S28) for a diagonal tensor Q with Qϕϕ>0. This choice corresponds to the physical limit where filament alignment results in a higher contractile stress in the direction of filament alignment, while leaving stresses orthogonal to filament alignment unchanged. Such a choice appears compatible with experimental observations of polarization flows in the C. elegans embryo, where flows along the long axis of the embryo do not seem to be significantly influenced by filament alignment orthogonal to the direction of flows (Mayer et al., 2010). (A34) 0=δζ−R δPζ0+ ξ δQϕϕζ0+2ηb−ηs2ζ0∂sδvs− 1Rδr−R ∂s2δr. where PC and CK are short for pseudocleavage and cytokinesis respectively, and the hat denotes measured data. The parameter estimates are summarized in the table below. By fitting a single parameter to the data from both developmental phases, we achieve a good agreement between the theoretical description and the measurements (see Figure 3e and Figure 3—figure supplement 3, a constant offset was added to the theoretical ingression to take into account the thickness of the extra-embryonic layer). We find that the cortex deformations observed during furrow initiation are best matched with a myosin coupling ratio p3=ξζ0=21±5. Multiplying this ratio with the maximum order parameter along the embryo gives an estimate for the relative weight of anisotropic versus isotropic myosin-dependent stresses in driving the ingression formation. 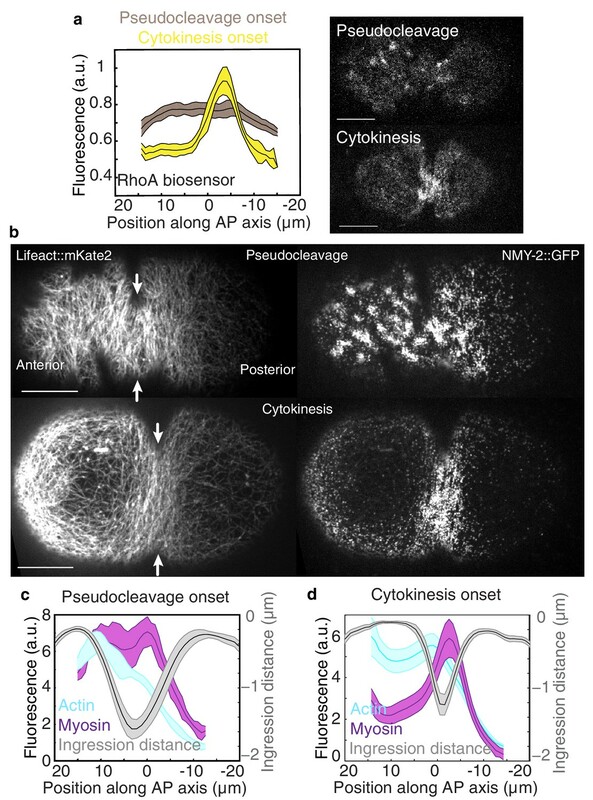 We find this ratio to be about 2 for pseudocleavage, and 3 for cytokinesis, indicating that anisotropic cortical tension due to actin filament alignment is crucial to explain the observed cell shapes during furrow initiation. Indeed, setting the stress-alignment coupling to zero (p3=0) produces very poor agreement with the measured data (see Figure 3e and Figure 3—figure supplement 3). The Journal of Cell Biology 111:1905–1911. Annual Review of Biochemistry 75:543–566. The Journal of Cell Biology 121:1343–1355. The European Physical Journal E 16:5–16. Trends in Cell Biology 22:61–81. Journal of Theoretical Biology 300:344–359. Cold Spring Harbor Perspectives in Biology 1:a003400. Trends in Cell Biology 15:651–658. Seminars in Cell & Developmental Biology 21:881–891. The Journal of Cell Biology 146:439–451. Journal of Open Research Software 2:1202–1215. Molecular Biology of the Cell 22:3165–3175. Journal of Theoretical Biology 101:289–316. Molecular Biology of the Cell 19:318–326. Thank you for submitting your work entitled "Cortical Flow Aligns Actin Filaments to Form a Cytokinetic Ingression" for consideration by eLife. Your article has been favorably evaluated by Naama Barkai (Senior Editor) and three reviewers, one of whom, Pekka Lappalainen, is a member of our Board of Reviewing Editors. Our decision has been reached after consultation between the reviewers. Based on these discussions and the individual reviews below, we regret to inform you that your work will not be considered further for publication in eLife. All three reviewers found the topic of the study highly interesting, and stated that combining experiments and theory is certainly valuable for understanding the mechanisms underlying the formation of pseudocleavage furrow during interphase and a cytokinetic furrow during cell division. However, as you will see from their comments below, the reviewers felt that the main conclusions of the study are not strongly supported by the experimental data presented in the manuscript. Especially reviewer #2 listed a number of weaknesses in the experimental design and interpretations of the data from RNAi and cell biological analyses. This, together with a lack of considering alternative theories, weakens the overall conclusions of the study. Therefore, an extensive amount of additional work (such as additional, more specific RNAi experiments and studying the possible contribution of a local zone of RhoA activation in this process) would be required to convincingly demonstrate that aligning actin filaments through cortical flow indeed drives the formation of contractile ring. The mechanism by which contractile actomyosin ring is formed for cytokinesis in metazoan cells is not fully understood, and for example whether the ring is generated through converging flows at the equatorial region or through a 'search-and-capture' mechanism is unknown. Here, Reymann et al. approached this question by studying the one cell embryo of C. elegans, where two constricting ingressions, a pseudocleavage furrow during interphase and cytokinetic furrow during cell division, are formed. Studies using experiments and theory provide evidence that aligning actin filament bundles through cortical flow drives the formation of ingression during both pseudocleavage and cytokinesis. This work provides interesting new information concerning the mechanisms of cytokinesis in metazoan cells, and majority of the experiments are of good technical quality. However, there are some points that should be addressed to further strengthen the study. Furthermore, this manuscript was not particularly reader friendly and thus the authors should rewrite the text and figure legends to make the manuscript more accessible for a general reader. 1) My biggest concern is the rationale of the RNAi studies presented in Figure 4. The authors conclude form the phenotypes of nop1, ani1 and mlc-4 knockdown cells that decreased compression rates (but not the modification of the actomyosin gel organization) are responsible for the lack of pseudocleavage in nop1 RNAi cells. However, because NOP-1 is an activator of RhoA, and is thus likely to affect myosin II activity through myosin light chain phosphorylation, both nop1 and mlc-4 depletions should have a similar effect on myosin II activity and organization of the 'acomyosin gel', which does not seem to be the case. This should be examined/clarified by additional experiments or the rationale of the experiment should be more clearly explained in the text. 2) The main difference between nop1 and mlc-4 RNAi cells (based on Figure 4) is the lack of intense actin filament bundles in the absence of NOP-1. Because NOP-1 is an activator of RhoA it is likely that, in addition to defects in myosin II light chain phosphorylation, the dynamics of actin filaments in nop1 RNAi cells are more rapid as compared to control or mlc-4 RNAi cells (due to effects of RhoA on cofilin activity). Would it thus be possible that the lack of proper actin bundles and myosin foci in nop1 RNAi cells is due to rapid actin filament turnover and consequent defects in actin filament cross-linking? 3) From Figure 1A and Video 2 it seems that myosin II forms much larger foci before pseudocleavage furrow formation than before the cleavage furrow formation. Is this indeed the case in all cells? What is the reason for this, and can this phenomenon contribute to differences between these two ingressions? This manuscript combines experimental and computational approaches to investigate the mechanism of cleavage furrow ingression. In particular it seeks to evaluate the contribution that cortical flow based alignment contributes to cleavage furrow ingression. The authors conclude that filament alignment through flow is a highly generalized mechanism for cortical reorganization (Abstract) that is sufficient to account for furrow ingression. This strong conclusion is not well supported experimentally. The authors examine whether cortical flow driven alignment or whether the SCPR model developed in S. pombe is responsible for cytokinetic ingression. However, they do not examine whether these are the only two possible mechanisms nor do they provide a rationale for focusing exclusively on these two mechanisms. Notably, they do not examine whether local RhoA activation could provide an alternative mechanism, despite the fact that there is copious evidence that RhoA can be activated locally. This local activation could provide an additional mechanism, indeed it appears to be the evolutionarily conserved mechanism in metazoa. Overall, the manuscript is based predominantly on theory that is substantiated – in part – by experimental data. There are several major weaknesses. First, the theory is not described in a manner that is accessible to scientists outside of the biophysical modeling field. Second, the experimental perturbations are not exhaustive nor diagnostic. Thus, at least for a cell biological audience, the basis for the strong conclusions are not clearly articulated. Third, the authors fail to properly account for the knowledge concerning the perturbations used (see points 2, 3 below) thus weakening the overall conclusions. Fourth, the authors do not consider all reasonable alternative theories. To reiterate, the authors appear explore whether cortical flow induced filaments explain all furrowing behavior in the C. elegans embryo. There is extensive prior evidence that cortical flows exist in the early embryo (8509454, 15363415) and previous evidence demonstrating that these flows can contribute to filament alignment (8509454, 22918944). Thus it is not a novel insight that cortical flows can contribute to alignment and furrowing. However, the stronger statement, that furrowing is inextricably linked to cortical flows – which would be novel – is not convincingly tested. Due to the role of myosin in promoting cell polarization, the C. elegans embryo cortex has extensive networks of cortical myosin during cytokinesis. For example, NOP-1 directed RhoA activation induces abundant cortical myosin during anaphase (as well as during polarization). In addition, CDC-42-dependent myosin accumulation results in cortical myosin that persists into anaphase and temporally overlaps with cytokinesis (PMID 19923324). However, furrows can form in the absence of such pools of actin and myosin. For example, in embryos with posteriorly localized spindles a posterior furrow forms in the absence of a broad zone of actomyosin (the cortical actomyosin is largely concentrated in the anterior). Moreover, local, centralspindlin-dependent induction of RhoA (PMID 22918944) can generate furrow directed flows of these populations of actomyosin. Thus, the authors have limited their analysis to situations with extensive cortical myosin and that would be expected to flow towards a local zone of RhoA activation. However, the authors do not explore the contribution that a local zone of RhoA activation would make to furrowing. If embryos do furrow in the absence of such flows, then the conclusion that flows are critical for furrow formation would be incorrect. Actomyosin cortex is reorganized during cytokinesis to form a contractile cytokinetic furrow. Using a combination of high-end imaging and modeling, Reymann et al. explore cortical actomyosin dynamics during furrow formation in a single-celled C. elegans embryo. They make use of two consecutive events occurring post-fertilization, pseudocleavage and cytokinesis proper. The authors propose that active cortical flows align actin filaments to help form cortical ingression. This work is related to a previous theoretical study by one of the co-authors that suggested that the flow could be sufficient to reorient actin filaments tangentially. The authors further propose that material properties of the actomyosin cortex are different during pseudocleavage and cytokinesis. The imaging data is generally of high quality and the theory is interesting. The story is really about pseudocleavage rather than cytokinesis but I don't think that this makes it potentially less interesting. With the caveat that actin biophysics is not my area of research I do not have issues with the central premise of the work. Having said that, I feel that the authors occasionally hype-up the novelty of the story and also sometimes over-interpret their results. I will give a few examples below. It is possible that some of the issues could be addressed with re-writing, but others need additional experiments. 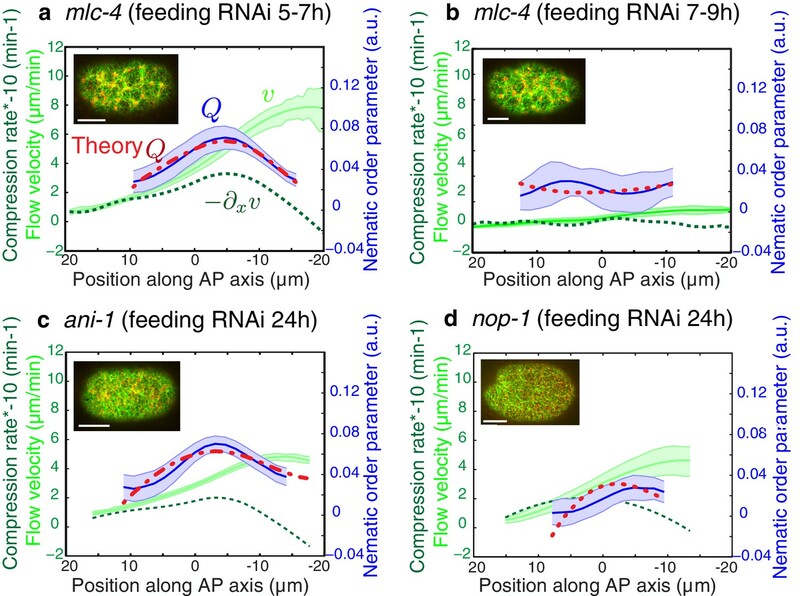 From the graphs and images shown in Figure 4, it looks like flow velocity, compression rate and even the overall architecture of the cortical actomyosin are comparable in nop-1 and ani-1 embryos. Yet filaments align in ani-1 cells. Why is that? I wonder if probing cortical tension with laser ablation might give insights into differences in cortical properties between these conditions. Related to the previous point, it is now clear why the authors summarize their data differently in Figure 4E for the two RNAi conditions – e.g. why polarizing flow is represented as normal in anillin mutant but defective in nop-1? The graphs in Figure 4A and 4B show similar values. Similarly, why pseudocleavage ingression is shown as partially flawed in ani-1, while there is nothing obviously wrong with ingression in Figure 4B? This entire panel in Figure 4 needs a wild type control to make comparisons easier. It would be useful if the authors extended their analyses to other abnormal situations, in particular looking into conditions that directly affect actin filaments rather than myosin function (e.g. actin RNAi embryos that fail pseudocleavage but not cytokinesis, or cofilin). It is not clear to me why the proposed model does not consider active filament alignment through motor activity. There is indeed no myosin enrichment at the site of furrowing in pseudocleavage but the myosin is still present there and presumably its activity could be regulated. The cortical actomyosin is clearly different in nop-1 or ani-1 embryos – but what does this more homogeneous network mean in terms of cortical properties? Is tension more evenly distributed? Do filaments align during initial cortical contractions prior to pseudocleavage? The Abstract states that it is "unknown" how cortex "reorganizes itself to generate the contractile ring" but surely there is a lot of knowledge in the field about this process. In Introduction, the authors posit that two distinct mechanisms can explain metazoan ring formation and propose to sort out which one is correct. Yet, one of these hypotheses was suggested for fission yeast, and even then it remains a hypothesis, with other groups demonstrating that rings can be assembled in the absence of cortical nodes required for search-and-capture mechanism to function. On the other hand, there is a lot of evidence of converging cortical flows during cytokinesis and actin filament alignment in metazoan furrows. Related to Figure 4B, the title is misleading – anillin is not the only bundler and so the authors can't say "Actin bundling is dispensable for actin alignment". Related to Figure 4A, perhaps the authors could think of a better heading for nop-1 chapter – that fact that nop-1 is required for pseudocleavage has been known for 20 years. Thank you for submitting your article "Cortical flow aligns actin filaments to form a furrow" for consideration by eLife. Your article has been favorably evaluated by Naama Barkai (Senior Editor) and three reviewers, one of whom, Pekka Lappalainen (Reviewer #1), is a member of our Board of Reviewing Editors. Because two of the original reviewers declined to review the new submission, your manuscript was evaluated by the Reviewing Editor and two new external reviewers. Through the decades of research, many different models have been proposed to explain the formation of contractile forces at the cell division site. Here, Reymann et al. approached this question by studying the pseudocleavage furrow and cytokinetic furrow formation in the one cell embryo of C. elegans. This work provides evidence that cortical actin flows converging on the cell equator may compress and mechanically align the filaments to drive furrow formation. The authors developed an actin marker that allows imaging of actin bundles at unprecedented resolution, and applied sophisticated image analysis methods combined with theoretical model to test the contributions of possible mechanisms. Experimental data are well described by the theoretical model, and the predictions of the model were tested by mutants affecting flow patterns. In general, this manuscript makes an important advance into our understanding of cytokinesis, and provides strong evidence that actin flows are critical in aligning the filaments at the division plane. However, there are few issues that should be thoroughly addressed to further strengthen the study. 1) The images of cortical actin filaments are striking, and were taken by a new LifeAct-Kate marker for F-actin. There is, however, some concern that the LifeAct probe may be stabilizing filaments/bundles, which can occur upon high levels of expression (Courtemanche et al., 2016 NCB); in the worst case scenario, the over-stabilization of filaments could bias the formation of the ring from pre-assembled filament bundles. The authors state in the methods that "overall cortical organization and flow dynamics appeared to not be affected by this reagent, foci lifetime, spacing, cortical flow velocities were similar to previous measurement with other fluorescent lines." These data should be shown as 'Supplemental information'. What are these other fluorescent markers? Assays that examine the dynamic turnover of filaments should be included. The dynamic behavior of actin should not only be compared with other LifeAct strains, but with other markers that do not directly affect actin dynamics. 2) In Figure 1, the authors used an 'active RhoA biosensor' to examine RhoA activity during pseudocleavage and cytokinesis. Which RhoA biosensor was used here? The details of this experiment should be described in 'Results' and 'Methods' sections. Furthermore, the active RhoA and myosin II appear to display very similar punctuate distributions with each other during pseudocleavage (Figure 1A and B). The authors should thus examine whether the active RhoA and myosin II co-localize in these cells. Furthermore, they should confirm that the 'active RhoA biosensor' does not just simply detect phosphorylated myosin II in these cells. 3) One fairly important point that should be discussed in more detail, is connected to the method used to extract the nematic order parameter of the actin filaments within the cortex. Are the authors sure that they are measuring meaningful order parameters? It seems to me that once the filament concentration becomes too high (the filaments are then closer the optical resolution) the anisotropy in the local Fourier transform will start to wash away, leading to measurements that do not indicate the true orientational order within the cellular cortex. Because of the quantitative nature of the study, it is essential that their measurements of nematic order are quantitative. Therefore, this method needs to be justified, perhaps by applying it to a simpler system with a known order parameter. Thank you for resubmitting your work entitled "Cortical flow aligns actin filaments to form a furrow" for further consideration at eLife. Your article has been favorably evaluated by Naama Barkai (Senior Editor) and three reviewers, one of whom is a member of our Board of Reviewing Editors.. The manuscript has been improved but there are some minor issues concerning one supplemental figure (see comments by reviewer #1 below) that need to be addressed before acceptance. The authors have now satisfactorily addressed the main concerns. However, the new data presented in Figure 2—figure supplement 5 should be properly discussed in the 'Results' and the constructs/strains used in these experiments (e.g. the worms expressing the PLST-1:GFP) should be described in the 'Methods' section. The reviewers have done a very good job addressing the major concerns on the manuscript. As described in their letter, they have added important data to the manuscript and clarifications in the text. I think that the manuscript is now acceptable for publication. The authors have thoroughly addressed all my concerns regarding the method used to measure the nematic order parameter. I believe that this interesting manuscript is suitable for publication in its current form. The reviewer’s comments made us realize that we had pitched our work wrong, and that our manuscript lacked clarity in order to convey effectively our main findings. We have taken some time to do additional experiments and analysis, and modify and rewrite extensively our manuscript. First, as suggested we now consider an alternative active alignment theory(Search and Capture) in our analysis and can now show that this alternative mechanism does not contribute significantly to the equatorial alignment of filaments in our system. Second, we now investigate the contribution of a local zone of RhoA activationto this process. This was a great suggestion by the referees, and we now utilized an active RhoA probe to show that, for pseudocleavage there is in fact no local zone of RhoA activation at the cell equator, and filament alignment here happens only by flow. This is a major addition to our manuscript. These two additions have very much shifted the focus of our work. Indeed, our first version was too concerned with detail and with the precise mechanism of function of various genes to the process, which we had tested by RNAi. This was correctly criticized by the referees, we had over-interpreted our results. In our overhaul of our manuscript and given the shift of focus, we have now substantially shortened this part of the manuscript and reduced it to the essential. Importantly, we remain descriptive here and refrain from drawing several of the conclusions that were criticized by the referees. We think that much of the criticism that has arisen was due to our inability to provide a clear and central message in our original work, leaving the referees in a bit of a void with respect to what we are really showing. We have shortened the manuscript and condensed its message, clarifying that this is really a manuscript that seeks to investigate the physical mechanismsof furrow formation, and the biophysical aspects of cortical mechanicsthat ensure cytokinesis to take place. We test alternative models, and focus our analysis of the regulatory aspects more on RhoA than on the other genes. This work, however, does bridge into the biophysics and theory much more than many other papers do, and we think that this is also its core strength. This criticism, along with other criticism below on the RNAi studies presented, forced us to reconsider the main message of the work and the pitch of the entire paper. Thus in response to this comment we have significantly shortened the paragraph entitled “nop-1 RNAi abolishes pseudocleavage formation”, as well as the following paragraphs on RNAi experiments. We focus our discussion and conclusion on the core result, that reducing flow speeds results in reduced alignment of actin filaments. NOP-1 indeed acts upstream of RhoA, and thus affects MLC-4, thereby reducing myosin activity. As a consequence, nop-1 and mlc-4 RNAi both lead to decreased flow rates due to lower levels of active myosin, which we show, results in reduced local alignment and furrowing. However, NOP-1 also directly affects actin organization by affecting the activity of several other actin binding proteins (through anillin, formin or cofilin for example – as also pointed by the reviewer in the text concern), which would explain the difference of phenotypes between nop-1 and mlc-4 RNAi (mlc-4 affecting only myosin II activity). Importantly we here used mild mlc-4 RNAi conditions, instead of full knockdowns, in order to decrease progressively compressive flows without affecting the overall cortical organization (keeping the presence of myosin foci for example as shown in Figure 4—figure supplement 1). To answer the reviewers specific concern, nop-1 RNAi can have similar effects on myosin II activity than mlc-4 RNAi however the organization of the 'actomyosin gel' is clearly different in the two cases. In response to this comment we have rewritten the corresponding section of the manuscript, condensed the corresponding figure, and focused our analysis and discussion on the only thing we can really conclude from the RNAi experiments, which is that reducing flow speeds results in reduced alignment of actin filaments. This is an interesting point, RhoA was shown to inhibit cofilin and cofilin increases turnover, so it is true that potentially nop-1 RNAi could increase turnover of actin structures. However, in light of the major overhaul of our work and the change of focus to a more biophysics-oriented manuscript, we think that this is beyond our main message now and have chosen not to discuss this issue in the main text. In response to this comment we have rewritten the corresponding section of the manuscript, condensed the corresponding figure, and focused our discussion of the mlc- 4 and nop-1 RNAi phenotypes on highlighting that in both, reducing flow speeds results in reduced alignment of actin filaments. This is a very good observation – indeed myosin seems to generate larger foci at cytokinesis. We currently have a manuscript under review that is concerned with the mechanisms of myosin pulsation in C. elegans, showing that there is an active RhoA spatiotemporal oscillator driving myosin foci formation in C. elegans. Importantly, modulation of active RhoA levels affects the spatiotemporal characteristics (size, timescale) of this pulsation. The observation from the referee thus suggests that the RhoA levels are different in pseudocleavage and cytokinesis – and they are, as we show with our new experiments using an active RhoA probe (Figure 1A). However, while this would be really interesting to understand more, we do think that this is beyond our core message and we have chosen not to investigate this at greater detail in this manuscript. Our complete overhaul of the manuscript now takes into explicit consideration these very important and interesting comments, and we hope that the referee agrees that we have taken his/her concerns seriously and addressed them to the best way we can. In response to the first concern here, from a physical perspective two different types of mechanism can explain an increase of actin filaments alignment for cytokinetic ingression, either an active alignment process such as by molecular motors in the Search and Capture model or a passive alignment due to mechanical constraints imposed by compressive flows. In this new version of the manuscript we now distinguish between these two alternative mechanical contributions. We conclude that compression by flow and not myosin-based active alignment is the driving force of ring formation in both pseudocleavage and cytokinesis (see Results and Discussion, first and fifth paragraphs and Figure 3—figure supplement 2). In response to the second reviewer’s concern, we also now discuss the contribution of a local active RhoA equatorial zone during the formation and ingression of furrows and use a probe for active RhoA. This was a great suggestion by the referee, we find that this mechanism does not operate during pseudocleavage since active RhoA (like myosin itself) is not enriched at the position of the pseudocleavage ingression (see the new Figure 1A). For this reason we can conclude that pseudocleavage cannot be triggered by local zone of RhoA activation (which is the basis of an active Search and Capture mechanism) but instead results from compression based alignment. Thus we conclude that pseudocleavage solely arises as a by-product of flow-driven cell polarization. This important suggestion has significantly improved our manuscript, and caused us to shift our focus more on pseudocleavage and the physical mechanisms of filament alignment, and importantly also prompted us to compare the contributions from flow based alignment and search-and capture. Overall, the manuscript is based predominantly on theory that is substantiated – in part – by experimental data. There are several major weaknesses. First, the theory is not described in a manner that is accessible to scientists outside of the biophysical modeling field. Second, the experimental perturbations are not exhaustive nor diagnostic. Thus, at least for a cell biological audience, the basis for the strong conclusions are not clearly articulated. Third, the authors fail to properly account for the knowledge concerning the perturbations used (see points 2, 3 below) thus weakening the overall conclusions. Fourth, the authors do not consider all reasonable alternative theories. To reiterate, the authors appear explore whether cortical flow induced filaments explain all furrowing behavior in the C. elegans embryo. There is extensive prior evidence that cortical flows exist in the early embryo (8509454, 15363415) and previous evidence demonstrating that these flows can contribute to filament alignment (8509454, 22918944). As mentioned earlier we realize that our previous manuscript lacked clarity in order to convey effectively the main findings of our work. We thus took some time to modify it extensively. With respect to the first concern, we rephrased in simpler words our description of the biophysical theory presented here (the fourth paragraph of the Results and Discussion section detailing equation 1 and defining the parameters used). The schematic representations presented in the Figures (such as 2B, 3A or D) should also be a helpful aid for scientists outside of the biophysical modeling field. With respect to the second and third concern, we agree that the analysis and discussion of the perturbation experiments in the first version of our manuscript was superficial and lacking substance. We have now performed additional experiments and importantly, have streamlined our conclusion, including only those required to substantiate the fact that compressive flows are required for the observed alignment process. It is not our intention in this paper to decipher the whole molecular requirement for cortical flows establishment, neither the individual molecular regulation of cortical material properties (we have another manuscript in preparation on this topic) and their impact on compression based alignment process. Finally, as mentioned above, our new findings have shifted the focus of the work this is why we have now substantially shortened this part of the manuscript. With respect to the fourth concern and as mentioned above, we have taken this seriously and now consider an alternative physical theory; the Search-and-Capture model brought up by the referee in which direct active alignment by motors contributes to ring formation (see Results and Discussion, fifth paragraph and Figure 3—figure supplement 2). This was a great suggestion, which has helped us to improve our work. Importantly, we can now show that compression by flow and not myosin-based active alignment is the driving force of ring formation in both pseudocleavage and cytokinesis. Thus it is not a novel insight that cortical flows can contribute to alignment and furrowing. However, the stronger statement, that furrowing is inextricably linked to cortical flows – which would be novel – is not convincingly tested. In the 30 years following the seminal publication from White and Borisy, it is true that this mechanism of flow based filaments alignment was often mentioned and has been well accepted in the field. On one hand, observations from fixed cells have shown actin filaments alignment at the cell equator of dividing cells (Maupin and Pollard 1986, Fishkind and Wang 1993, Kamasaki et al. 2007), one the other hand flows towards the cell equator were observed in live cells. However, it has never been tested if this mechanism is actually at work. This requires a framework for testing the hypothesis. This framework was only recently provided by active gel theory, and we here for the first time show that compression and shear flow indeed aligns filaments. This is a novel and important addition to our understanding of actomyosin networks. With regards to the second statement, it is clear that not all furrows are generated by cortical flow and compression. Hence, flow-based alignment is not the only mechanism and furrowing cannot be inextricably linked to cortical flows. Search and Capture is a prominent alternative mechanism, and we now show in our revised manuscript that it contributes via active alignment, albeit only to a small degree (Results and Discussion, fifth paragraph). The referee has prompted us to investigate active RhoA, and we now show that the pseudocleavage furrow arises without an equatorial zone of RhoA activation (new Figure 1A). We can thus conclude that furrow formation is possible in the absence of a local zone of RhoA activation. In the revised manuscript we also included in our theory the contribution of direct myosin accumulation (such as the consequence of an equatorial local zone of RhoA activation) by the addition of an active alignment contribution of myosin molecular motors (equation 3). However, it is impossible for us to test experimentally a condition where a local zone of RhoA activation would be present in the total absence of flow, as RhoA by recruiting active myosin leads to a gradient of contractility which results in the generation of flows. In response to the concerns raised here, we have rewritten much of the manuscript, focusing the work on pseudocleavage and the physical mechanisms that give rise to filament alignment. Actomyosin cortex is reorganized during cytokinesis to form a contractile cytokinetic furrow. Using a combination of high-end imaging and modeling, Reymann et al. explore cortical actomyosin dynamics during furrow formation in a single-celled C. elegans embryo. They make use of two consecutive events occurring post-fertilization, pseudocleavage and cytokinesis proper. The authors propose that active cortical flows align actin filaments to help form cortical ingression. This work is related to a previous theoretical study by one of the co-authors that suggested that the flow could be sufficient to reorient actin filaments tangentially. The authors further propose that material properties of the actomyosin cortex are different during pseudocleavage and cytokinesis. The imaging data is generally of high quality and the theory is interesting. The story is really about pseudocleavage rather than cytokinesis but I don't think that this makes it potentially less interesting. With the caveat that actin biophysics is not my area of research I do not have issues with the central premise of the work. Having said that, I feel that the authors occasionally hype-up the novelty of the story and also sometimes over-interpret their results. The referee could have not formulated his criticism more clearly. In response to this and other comments we have now essentially rewritten the manuscript, and toned down our language in this regard. I will give a few examples below. It is possible that some of the issues could be addressed with re-writing, but others need additional experiments. This is a very good observation, for easier comparison we now also added Figure 4—figure supplement 2E, F. In ANI-1 depleted cells filaments interactions are less stable (decreased level of bundling agents) thus could be aligned more easily than in the wild type. NOP-1 acting upstream of several actin organizing mechanisms (one of which being ANI-1), it is unclear if the level of bundling agent would be similar in nop-1 and ani-1 RNAi or if some additional mechanisms (such as through cofilin regulation for example) could be at work in NOP-1 depleted embryos. It is thus probable that the material cortical properties of nop-1 and ani-1 RNAi embryos would be different; explaining the better ability to align filaments in ANI-1 depleted embryos compared to NOP-1 depleted ones. Regarding reviewer’s #3 suggestion, we considered the use of laser ablation but dismissed this option since laser ablation is a good tool to probe cortical tension and evaluate some material properties such as the Maxwell time, the hydrodynamic length, the ratio of active stress and per-area friction (Saha et al., Biophysical Journal, 2016) but it is not yet possible to use it to obtain nematic material properties we discuss here. Related to the previous point, it is now clear why the authors summarize their data differently in Figure 4E for the two RNAi conditions – e.g. why polarizing flow is represented as normal in anillin mutant but defective in nop-1? The graphs in Figure 4A and B show similar values. Similarly, why pseudocleavage ingression is shown as partially flawed in ani-1, while there is nothing obviously wrong with ingression in Figure 4B? This entire panel in Figure 4 needs a wild type control to make comparisons easier. material properties but no proper cell furrowing is formed. In response to this comment we have removed the table originally Figure 4E that over simplified the observed phenotypes, we have added Figure 4—figure supplement 2 to make comparisons easier in between all the different experimental conditions, and have substantially précised our observations in the Figure legends of Figure 4—figure supplements 1 and 2. As already pointed out by reviewer #1 and #2 the perturbation experiments presented here are not an exhaustive case study of all abnormal situations. We have performed many more RNAi (also targeting directly actin organization) in our laboratory. Actin organization, dynamics and cortical contractility are in fact closely related and under the control of numerous molecular players, all of them controlling the material properties of this gel like material. Understanding such molecular control in detail is a long process and currently one of the main interests of our laboratory. However, in the manuscript presented here we have decided to include only those required to substantiate the fact that compressive flows are required for the observed alignment process. It is not our intention in this paper to decipher the whole molecular requirement for cortical flows establishment, neither the individual molecular regulation of cortical material properties (manuscript in preparation). In fact, the perturbation of the actin cortex dynamics is intrinsically linked to its material properties and thus affects polarization flows, making us difficult to disentangle the impact on compressive flows on the alignment process. Finally, as mentioned above, our new findings have shifted the focus of the work this is why we have now substantially shortened this part of the manuscript and reduced it to the essential. What we were trying to refer to is the actin filaments distribution – a more isotropic and uniform distribution as compared to an aster like bundled organization observed in the presence of myosin foci. Even though this is a very interesting question, in the scope of this paper we do not relate this observation to some physical cortical properties. Understanding such molecular control in detail is currently one of the main interests of our laboratory and a manuscript by Naganathan et al. is in fact in preparation on this topic. In response to this and other comments we have reduced significantly our discussion of the RNAi phenotypes and only focus on those aspects that focus on flow and compression, hence we have not pursued this any further. Prior to pseudocleavage during the initial cortical contractions, we observe only a little bit of local alignment (actin rings at the periphery of blebs or aster like patterns around foci). However, these are only transient local alignment patterns without any preferred direction along the axis of the embryo, and no large-scale orientation pattern is observed prior flow. Fixed. We have removed this statement. Abstract and Introduction were rewritten, we now compare the contributions from search- and-capture and flow-based alignment. Fixed. We no longer make this statement. Indeed, Lifeact can affect actin dynamics if expressed at high levels. For our work it is important to verify that our LifeAct construct does not impact flow and filament alignment profiles. We had performed a verification as part of our experiments, but had not added this information to the original manuscript. In response to this comment, we have performed additional verifications and added all this data, the new verifications as well as our previous work, to the supplement as requested. In particular, we had checked if anteroposterior flow-fields are similar with and without LifeAct. We found that anteroposterior flow-fields are similar in worms expressing NMY-2::GFP (Mayer et al) or NMY-2:mKate2 and our worms here expressing different constructs of LifeAct (Figure 2—figure supplement 5A-C). Therefore, flow- and compression fields are unaffected by the presence of LifeAct in our strain. We’d also like to explicitly point out that the pseudocleavage furrow was discovered in unlabeled embryos, and can be seen in every embryo by use of DIC imaging. Second to investigate if there is an impact on the alignment profile, we compared three different LifeAct constructs with distinct expression levels and different fluorophores. We find that both anteroposterior flowfields and the profile of nematic order are not significantly different between these three lines (Figure 2—figure supplement 5A-C). Note that for Lifeact:GFP the peak in nematic order is slightly lower than for the other two lines, but this is likely due to our quantification method and the reduced LifeAct fluorescence intensity signal (see also below). The general shape, however, is well preserved among the three lines, all three strains showed similar nematic order profiles with a peak of vertical alignment at the cell equator during pseudocleavage. Taken together, this indicates that we are using LifeAct at concentrations that do not significantly impact actin and actomyosin cortex dynamics. Finally, we verified that the dynamics of cytokinetic ring closure, another process that sensitively depends on actomyosin mechanics, appears similar both with and without LifeAct (see Author response image 1). Note that Lifeact is the best probe we have to follow in real time the dynamics of the actin filaments in C. elegans. All our efforts to directly label actin have led to severe actomyosin phenotypes that prohibit any type of quantitative analysis. Finally it is worthwhile noting that some actin bundling proteins are present in the cortex, such as plastin, and are stabilizing actin bundles in the cortical layer, especially in the cytokinetic ring as shown by worms expressing the PLST-1:GFP (endogenous CRISPR labeling, Figure 2—figure supplement 5D). Thus the cell autonomously stabilizes aligned bundles of actin filaments and it is likely that doing so reinforces the process of flow alignment coupling. We here used a RhoA biosensor developed by the Glotzer lab (GFP::AHPH, C. elegans strain MG617, Tse et al., MBoC 2012). This sensor consists of GFP fused to the C-terminal portion of C. elegans anillin, which contain its conserved region (AH) and pleckstrin homology (PH) domain. It lacks the N-terminal myosin and actin-binding domains but retains its RhoA-binding domain. This information is now more clearly detailed in the Materials and methods section of the manuscript (first paragraph). It is correct that active RhoA and myosin II display similar and overlapping foci patterns during pseudocleavage. In fact, we have in another manuscript from our lab that is currently under review with eLife as well, quantified the spatial and temporal correlation between active Rho and myosin (Nishikawa et al., "Controlling contractile instabilities in the actomyosin cortex", eLife: 12-07-2016-ISRA-eLife-19595). In this other work we report that feedback between active Rho and myosin induces a contractile instability in the cortex and discover that an independent RhoA pacemaking oscillator controls this instability, generating a pulsatory pattern of myosin foci. In Figure 1 of this other manuscript, where a spatio-temporal correlation analysis reveals that active Rho and myosin oscillate together (1F) leading to the generation of pulsatile behavior within the cortex (1C). Importantly however, our analysis reveals at a quantitative level the kinetics of myosin recruitment by active RhoA (1H). This figure shows that increasing active RhoA levels leads to an increase of myosin (red line), while the levels of myosin have no impact on active RhoA levels (green line). Hence our biosensor reports on RhoA activity, and does not just simply detect phosphorylated myosin II. The referee raises an important point here. Of course, we can only analyze what we can see in the light microscope. As such, our measured order parameter can only be viewed as an approximation of the actual nematic order parameter of the network. The method does capture general features of the state of alignment, which we tested by use of synthetically generated test images, and we have now added Figure 2—figure supplement 3 and 4 to demonstrate this. Here we generated random networks with an increasing amount of vertical orientation. Notably, our quantification method captures the anisotropy in these synthetic network, and measures higher nematic order parameters for networks with a higher degree of anisotropy. As the referee correctly points out, however, this only works if there is a significant amount of contrast in the image. If filaments get too dense and too close and are separated by distances that are of the order of the resolution in the light microscope, we are no longer able to detect this. And this is unavoidable; this is the price we pay for pursuing a live cell analysis. We are confident, however, that we do capture well the overall state of alignment. In particular we have chosen rather large box sizes for the Fourier analysis (3.15 x 3.15 µm), and our measures of nematic order represent averages over this length scale. Even the strongest of bundles do not reach a width that is near this value, hence the images that we fourier-transform have a sufficient amount of contrast and anisotropies are well detected throughout the cell. For this reason, we also analyze only the early stages of furrow formation, and stop before there is a pronounced ingressing ring with many closely positioned bundles that can no longer be individually resolved, and for which we would not be able to determine the state of alignment by use of our analysis. Furthermore, nematic order should be independent of network density. We tested this by generating synthetic networks of increasing densities, for a range of densities that resemble densities we observe in the embryo. Figure 2—figure supplement 4B shows that indeed, the profile of nematic order in a synthetically generated anisotropic network is to first order independent of network density when we use our algorithm, consistent with this prediction. The measurement of nematic order does, however, depend on the noise and on the overall contrast in the image. Again by using synthetic networks, we find that nematic order decreases with increasing noise (Figure 2—figure supplement 4C). For this reason, it is important to use the mKate2 LifeAct strain that is optimized for C. elegans and particularly bright. Importantly, we used the same imaging conditions and the same strain for all our experiments (otherwise stated), with similar amounts of noise in the images and with a similar image contrast. We have now addressed the remaining issue of reviewer #1 considering Figure 2—figure supplement 5, by adding a sentence to the Results section that discusses this figure appropriately. We also updated the Methods section that describes how these new strains were obtained. We thank Pierre Gönczy, Caren Norden, Enrique De La Cruz, Michel Labouesse, Tony Hyman and Marino Zerial for insightful comments on the manuscript. We thank Jean-Francois Joanny and Jacques Prost for invaluable discussions of some of the ideas presented here. We thank Ralph Böhme for his work on image quantification validation. A-C Reymann is supported by the Human Frontier Science Program LT000926/ 2012. AE is supported by the excellence initiative of the German Research Foundation (DFG-GSC 97/3). SWG was supported by the DFG (SPP 1782, GSC 97, GR 3271/2, GR 3271/3, GR 3271/4), the European Research Council (grant No 281903), ITN grants 281903 and 641639 from the EU, and the Human Frontier Science Program (RGP0023/2014). GS acknowledges support by the Francis Crick Institute which receives its core funding from Cancer Research UK (FC001317), the UK Medical Research Council (FC001317), and the Wellcome Trust (FC001317). The Max Planck Society also supported this work. © 2016, Reymann et al.